It does draw the attention. And probably does even reflect something within the story it's associated with. Considering the shudder pulps and their covers, all such things do tend to be relative...but also there's the question of how we think we're supposed to feel about that image...we wonder about how that's supposed to affect, much less appeal, to us. I wonder if Trojan was already a prophylactic brand by the time the pulp line took the name...good contributors, indeed...I'm not sure I've ever read a Trojan pulp or noted that stories I've read came from one. Turns out that yes, the Trojan publishers could've consciously wanted to pick up a resonance from the brand of the condom line...I know I've read a few Bellem stories and presumably some others they published. I collected a good many issues of Private Detective back when I first started chasing pulp magazines. 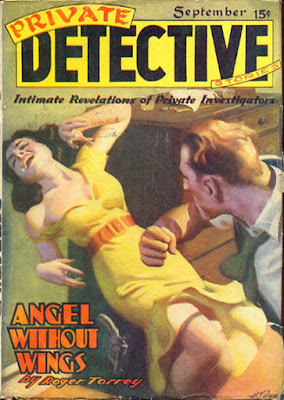 They didn't have the consistently strong contents of a mag like Dime Detective, but their vivid covers and more reasonable prices made them a decent substitute. Story quality was quite uneven, and although work by Bellem and Torrey often stood out, you can never tell what you're going to get wth this pulp. I've found that the stories by Laurence Donovan, often as Larry Dunn, are usually pretty good, too, as are the ones by Edwin Truett Long, who wrote as Cary Moran and a host of other pseudonyms. But you're right, John, overall the quality of all the Spicy pulps is wildly inconsistent. Even with Roger Torrey, you never really were sure of quality fiction in the 1940's PRIVATE DETECTIVE. Much of his work was well done for this magazine but there also were some subpar work. Later I learned that alcoholism led to Torrey's early death and I bet that his work in the 1940's suffered from his excessive drinking like another of my favorites, Walt Coburn. Of course Coburn lived to 79 or 80 and if he had not committed suicide, then he would have lived even longer. Torrey only made it to his mid-forties. There is a Black Dog Books collection of Torrey's work which has an excellent biographical piece on his life and sad ending.